Naiulat namin nuong november 10 na Little Star ang bagong kanta serye ihahandog ng kapamilya network sa darating na taon read the article here pero pinalitan na ito ng title. Hindi na Little Star ang magiging title nito dahil pinalitan na ito ng May Isang Pangarap ayon yan sa ipinalabas sa trade launch ng ABS-CBN para sa mga advitisers nuong isang gabi. Magsasama sina Vina Morales at Carmina Villaroel sa kanta serye May Isang Pangarap ang kwento nito ay tumatakbo sa kanila at sa kanilang mga anak na mahilig kumanta. Ipakikilala saatin ng Kapamilya Network ang dalawang bagong pasisikatin nilang mga child wonders sa taong 2013 na bida sa kanta serye May Isang Pangarap wala pa kaming info kung sino-sino ang mga batang lumabas sa teaser pero makakaasa kayo na iupdate namin kayo sa lalong madaling panahon. Abangan ngayon first quarter ang inaabangan kanta serye aawitan kayo gabi-gabi ang May Isang Pangarap starring Vina Morales at Carmina Villaroel soon on primetime bida. MANILA, Philippine -- After mounting the televised surprise wedding that made ladies across the country swoon, Zoren Legaspi may have just earned the modern day "Prince Charming" tag, according to his wife and partner of 14 years, Carmina Villaroel. "Hindi talaga namin in-expect, lalo na [si Zoren]," the Kapamilya actress, 37, was quoted as saying by the entertainment news website Push.com.ph, referring to the overwhelming response to her wedding with Legaspi, 40. On November 15, the two finally tied the knot shortly after the actor-host proposed to his long-time partner. Legaspi had enlisted the help of his children with Villaroel, Cassandra and Maverick, as well as colleagues of the actress-host from ABS-CBN, to carry out the surprise proposal and wedding ceremony held on a Thursday evening at Fernbrook Garden in Alabang, Muntinlupa City. The wedding was attended by celebrity colleagues of the couple and their non-showbiz friends and family. It was televised live on ABS-CBN's flagship newscast "TV Patrol," and later, in packaged form, via the TV special "Zoren-Carmina Always, Forever: A Wedding Like No Other." On the night the news of the wedding broke exclusively on "TV Patrol," terms related to the surprise affair and the names of the couple became top trending topics worldwide on micro-blogging site Twitter. The same feat was achieved when the wedding's TV special aired a week later. "Nung pina-plano nga [ni Zoren] wala siyang inisip na kung ano 'yung sasabihin sa kanya ng mga tao, na may pogi points pala ito para sa kanya. Wala talaga kaya nagulat talaga kami sa reaction ng mga tao," Villaroel said. "So natutuwa siya kasi parang lahat sila sinasabi na I’m so lucky kasi nga ginawa nga yun ni Zoren. Hindi na nga 'Prince Charming' eh, 'Zoren' na 'yung tawag 'di ba sa 'Prince Charming' na adjective," she added. For the "May Isang Pangarap" star -- the 2013 Kapamilya series was recently launched along with other new shows at the ABS-CBN Thanksgiving Trade Party -- she feels she cannot possibly top the surprise mounted by her husband. "Ay wala na, ito talaga sa kanya hindi ko na ma-ta-top 'yun. Hindi ko siya kayang bigyan ng ganung klaseng surprise. So siya naman hindi naman niya hinihingi o hindi naman siya nag-aantay ng kapalit. So wala, hindi ko siya i-a-attempt kasi hindi ko talaga siya kayang patalbugin," Villaroel said. My friend KitKat is also part of the cast. sana sa Kapamilya GOLD na lang ito. A Koreanovela should replace Aryana for now. Aryana's timeslot was originally going to Little Champ but that show was pushed back a few more months. MIP seems like the natural fit for that slot. Anyone have any clue who else is part of this teleserye? I hope we get some younger Star Magic artistas added as well. MANILA, Philippines -- Rachel Alejandro will portray the erstwhile rival of Vina Morales' character in the upcoming ABS-CBN series "May Isang Pangarap." During a sitdown interview with reporters on Thursday, Alejandro said she will have a guest appearance in the upcoming Kapamilya soap, which recently started filming. "May Isang Pangarap" is among the several new shows lined up for ABS-CBN's TV programming in the first quarter of 2013. 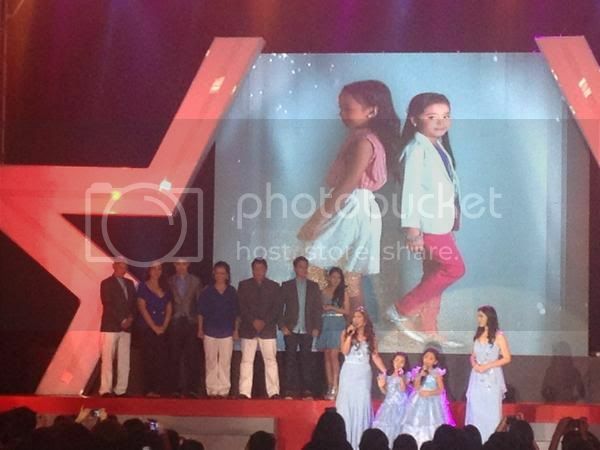 It was formally launched at the ABS-CBN Thanksgiving Trade Party last week. Along with Morales, Carmina Villaroel was introduced as among the series' cast members. According to Alejandro, Morales will "play the mom of the kid that's supposed to become a star." "[My part] is a guest role," Alejandro said. "Marami kasi silang stars na nilagay, para bongga 'yung opening. That's what I'm doing now, kaka-start lang." "It's the part of the story where they're establishing Vina was an aspiring singer na nananalo sa mga contest, then ako 'yung rival niya from Bohol. We're both from Bohol," Alejandro added. Her guest appearance in "May Isang Pangarap" marks Alejandro's return to acting for television. The stage performer said she had decided to take a break from the "taxing" performance required of a TV actor, citing its adverse effect on her singing voice. Late last year, Alejandro and other Filipino theater actors topbilled the Singaporean staging of the Broadway hit "Avenue Q." It ran from September 27 until October 4, with some shows sold out to "an entire office of Filipinos" based in the city-state, according to Alejandro. In 2013, Alejandro will take on Jinky Llamanzares' role in Atlantis Productions' local staging of "Rock of Ages." The Broadway show, which also stars Morales, will have its re-run starting July next year, Alejandro said.